Hella, from the Frankfurt area, spent one week helping on the farm, and left yesterday to head to Keveral near Looe (www.keveral.org/) for three weeks. 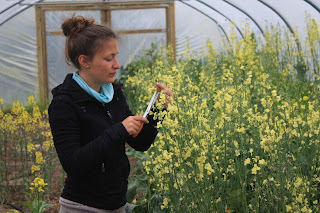 Thanks as always to Hella and all the hard work she put in during her stay. Hella cutting holes to plant tomatoes in the new Baby polytunnel. 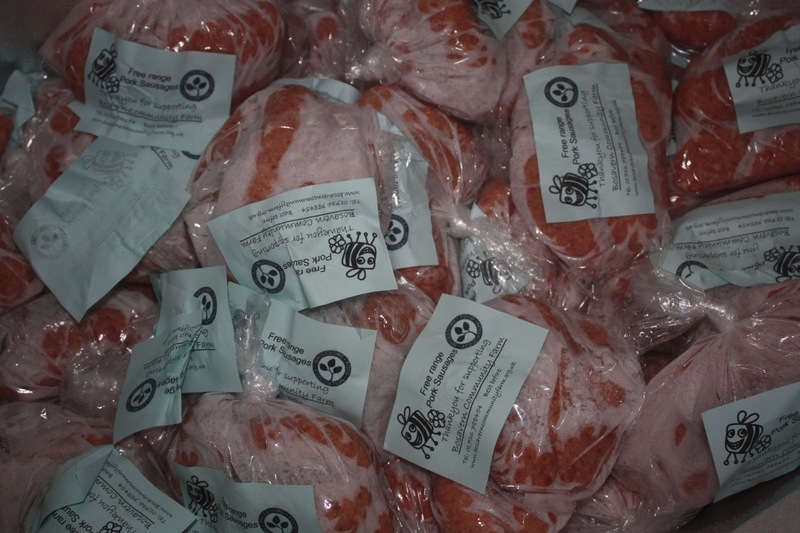 On Monday 20th May, the last of our pigs made their final short journey to the butchers in St. Just and became sausages. They were born here on the farm last July, and have lived outside in the fields for ten months - Nikolai, George, and the Spice Girls. They were good at ploughing the land and disposing of reject potatoes. 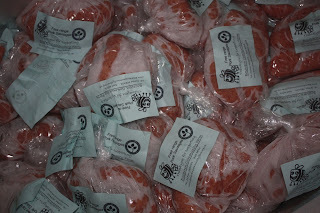 They are now in our freezer, selling at £3.50 per pack of six free-range rare-breed (Kune Kune) pork sausages - please come and ask to buy some. 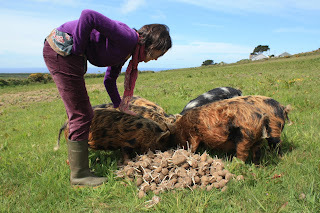 Saying goodbye to the pigs on their last day. A freezer full of sausages. After wwoofing on the farm for 3 weeks, Yaran (from Bern) moved on to his next wwoof placement last Friday. 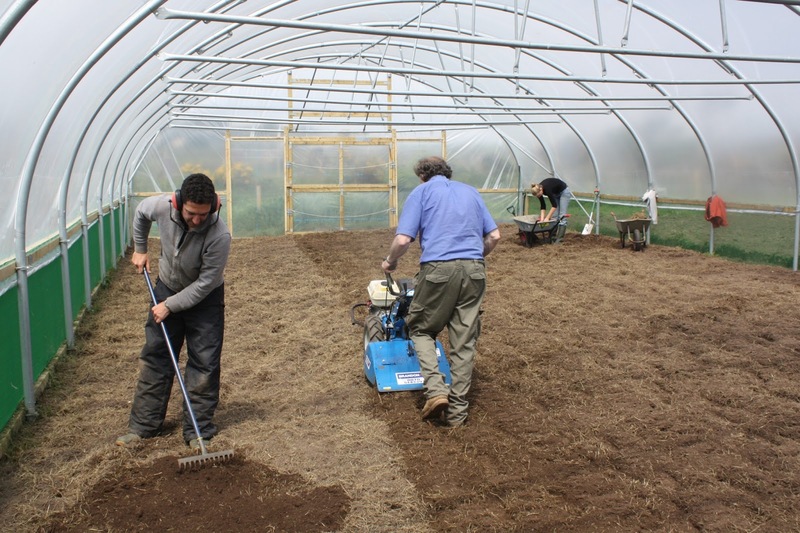 Many thanks to Yaran for his hard work on the farm. 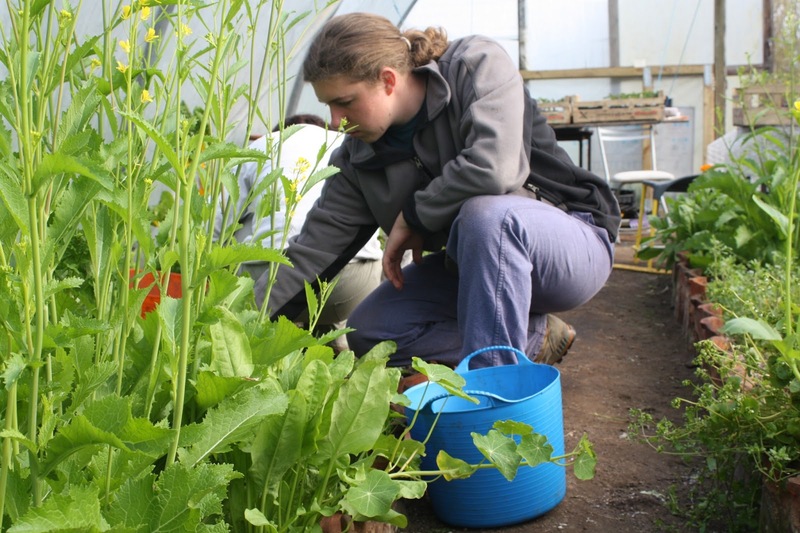 Yaran harvesting salads in the polytunnel. 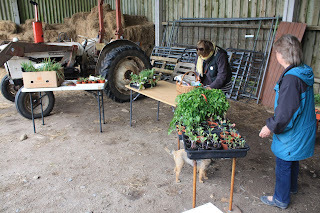 Preparing and planting the "New Baby". 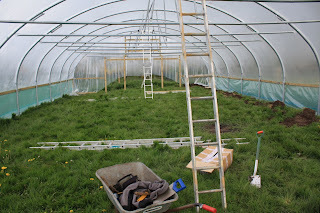 On Tuesday and Wednesday last week we hired a rotovator and prepared the inside of the new polytunnel. 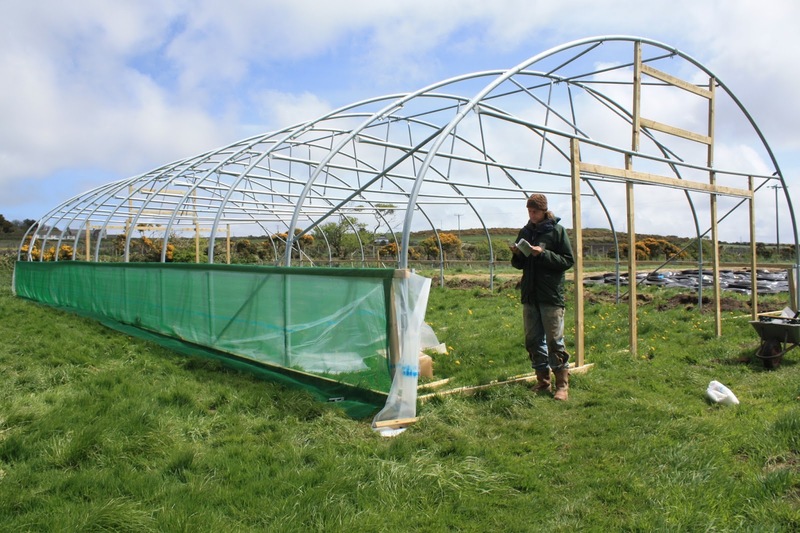 We decided against growing in grow-bags because of the cost of sourcing peat-free organic grow-bags, and we have reservations about the contents of standard bags. 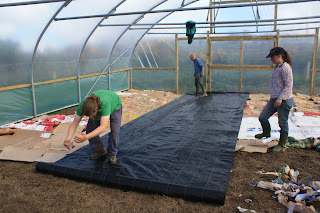 So we opted to rotovate the ground, pick out as much couch grass root as possible, lay cardboard and mipex (woven mesh weed suppressant cover), and plant through holes in the mipex. David rotovating, Carlos and Camille hunting for couch grass roots. 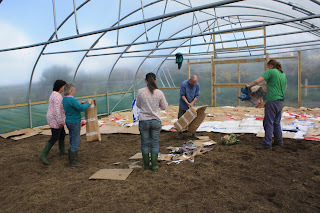 Laying cardboard and paper feed sacks as a mulch, with Emma, Jenny, Hella, Paul and Yaran. 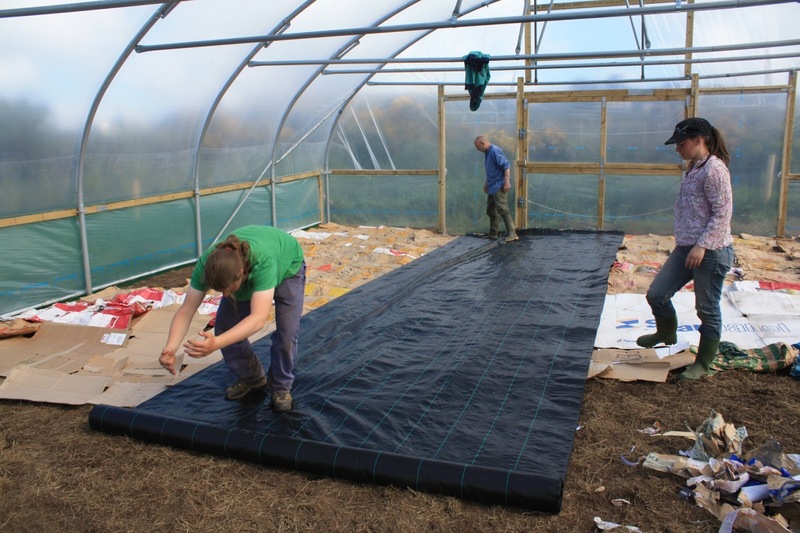 Unrolling the mipex flooring, with Yaran, Paul and Hella. 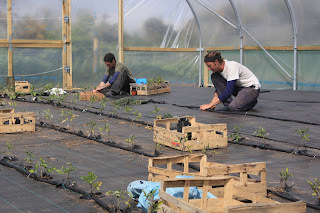 Planting the first tomatoes, with Hella and James. 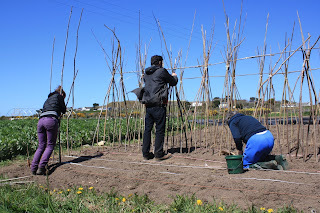 Planting the fifth line (of six) of tomato plants, with Carlos and James. 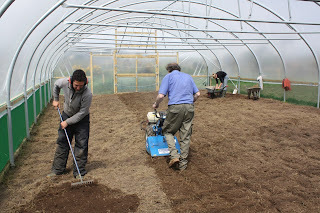 We laid the floor and irrigation on Thursday (unfortunately I miscalculated the amount of soaker-hose needed, which is what happens when you buy a polytunnel in feet and irrigation hose in metres! ), and planted 225 tomato plants through holes cut in the mipex on Friday. 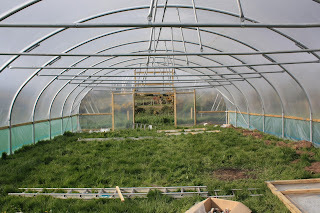 The plants are doing well, despite being held for too long in pots waiting for the tunnel to be completed. 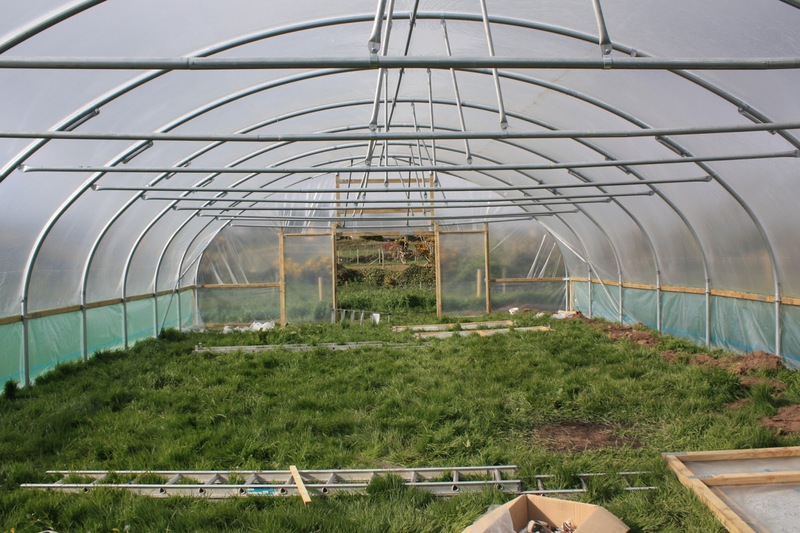 The remaining hose has been ordered, and we have spare plants, to give us 270 in total. 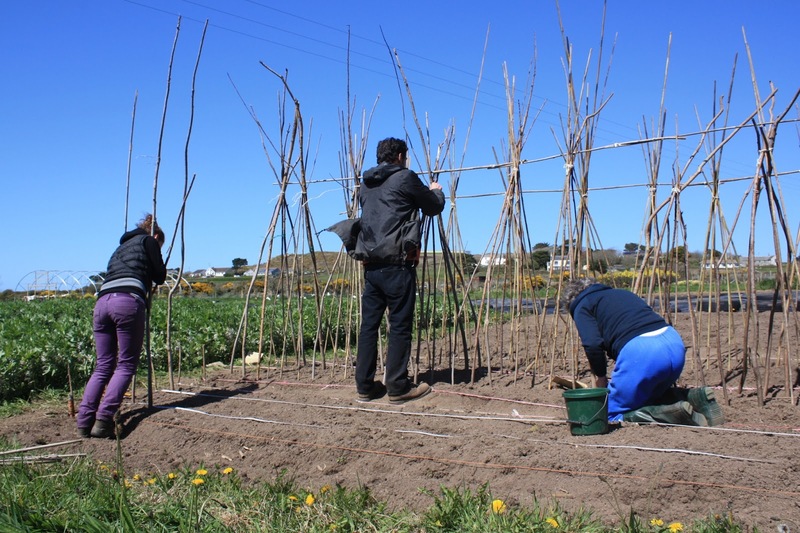 That leaves two irrigation lines spare, for our aubergines, tomatillos, pepino dulces, plus some squashes and courgettes, maybe more peppers and chillies too. If anybody wants to buy tomato plants at 50p each please come and ask! On Wednesday 22nd May the core group from Transition Penwith (www.transitionpenwith.org.uk) came to Bosavern Community Farm for a team building session, part of which was gardening at the front of the farmhouse and down the drive to improve first impressions of the farm. The transition team hard at work. 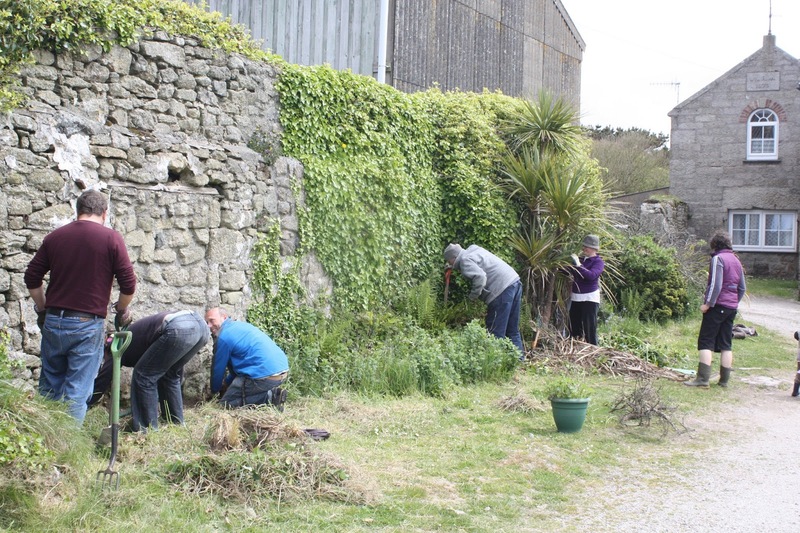 The front of the farm has a much more cared for appearance now, so thanks to all those who took part and got their hands dirty. After the gardening we all sat down for lunch outside together, with staff and volunteers from the farm too - thanks to Lynne for the excellent food again. 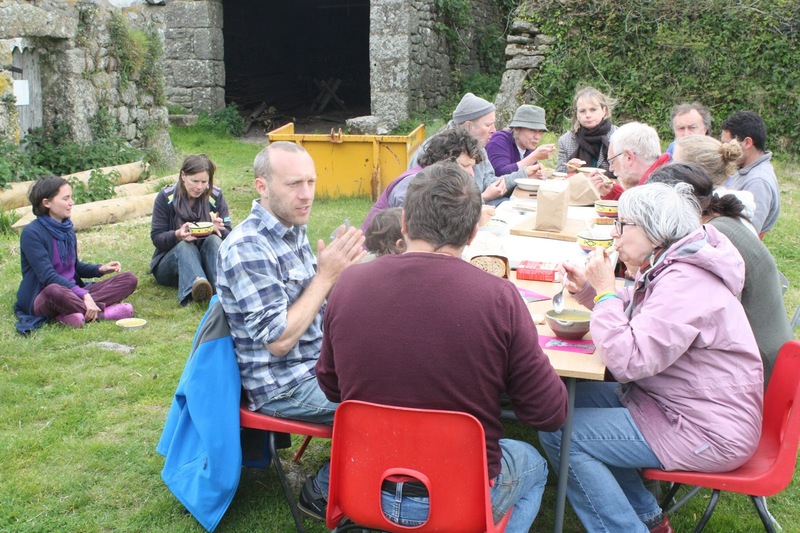 Sharing a meal in the farmyard. 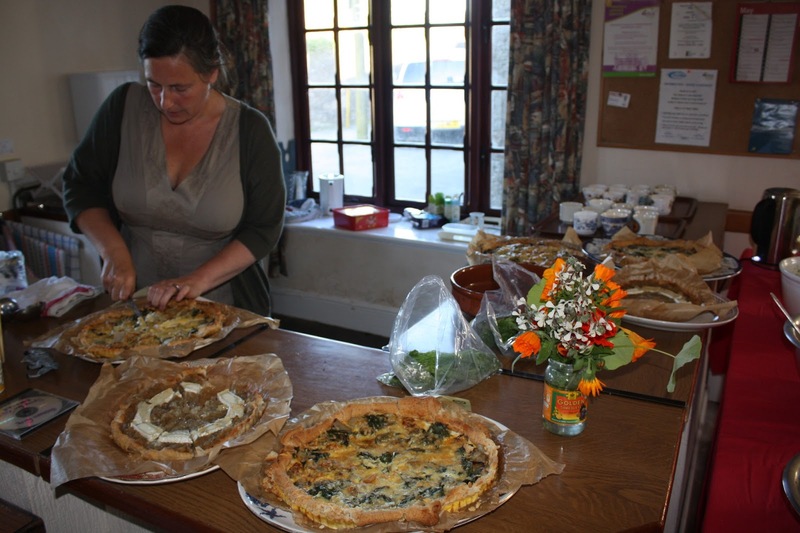 Food and film evening in St Just. On Saturday 18th May we put on our inaugural food and film evening in the Women's Institute Hall in St Just, which was organised by Lynne and attended by 20 people. 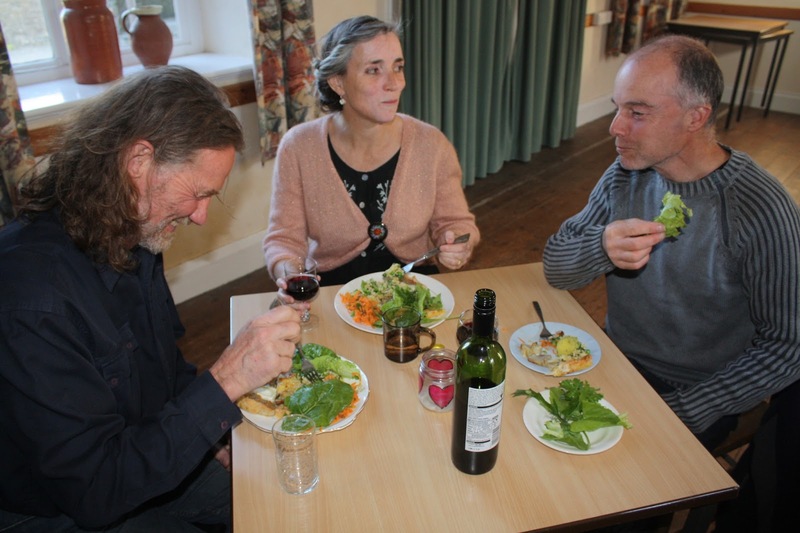 Lynne's home-cooked food was excellent and enjoyed by all, using lots of fresh ingredients from the farm, and the film was an empowering and inspirational look at how some people in the USA have got together to produce the local fresh food that their communities want, need and deserve. 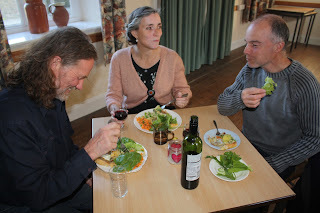 Andrew, Fran and Nick tucking in. 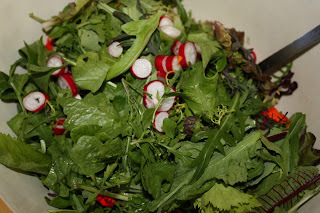 Delicious fresh salad, full of different leaves and herbs. 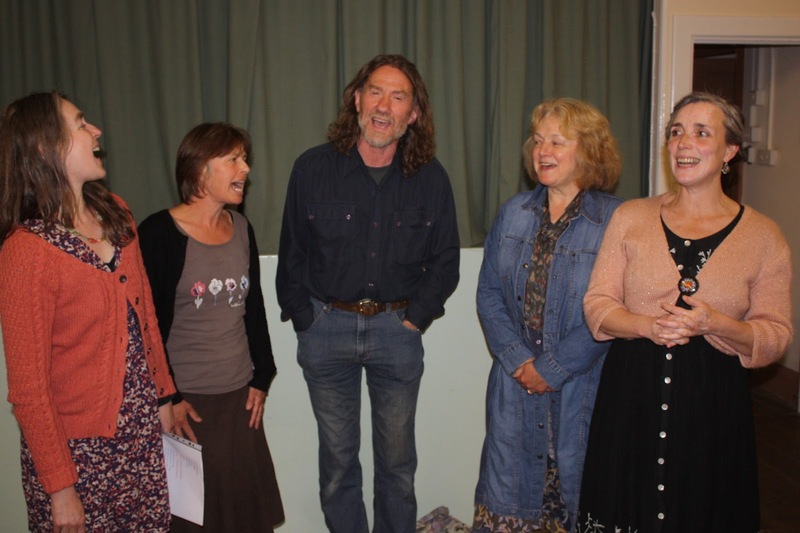 After the film we were entertained by the Bosavern Community Farm Singers, led by Kelsey, with their themes of farming and seasonal songs. After dinner entertainment - Kelsey, Kelly, Andrew, Glenda and Fran. Anybody who missed the evening but would like to watch the film, it can be seen for free on this link ediblecitythemovie.com. 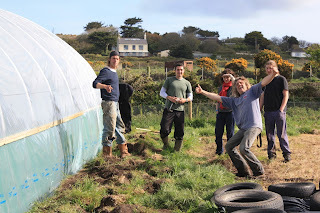 Four of us spent all last Wednesday preparing the new "Baby" polytunnel ready for skinning (constructing the side-venting, putting the last few pieces of timber in place, making sure all the necessary pieces were on hand, loading the wheelbarrow with tools, reading the instructions again, and forming a plan for the next day), then on Thursday 16th at 08:00 we were joined by 13 volunteers to get the polythene skin in place. Reading and understanding the instructions - very important! James and Carlos battening the side vents into place. 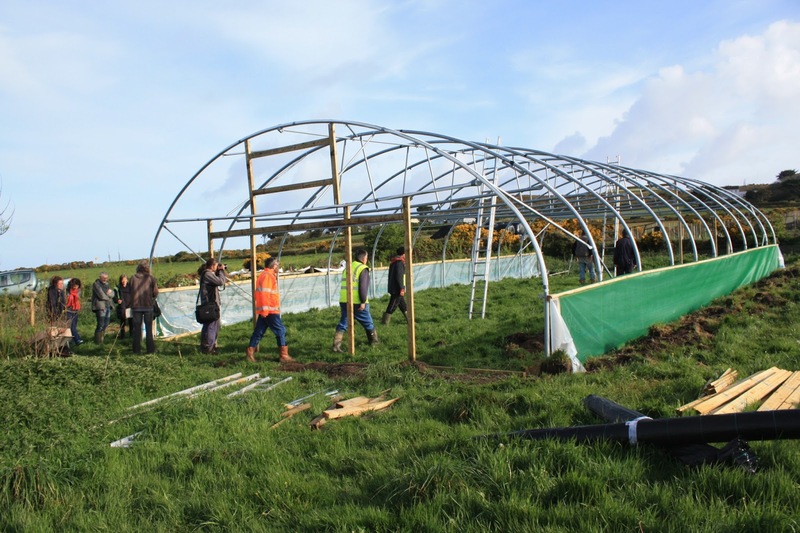 The weather behaved itself, as forecast, and there wasn't a breath of wind, so there was no panic to get the cover on and we could take our time and make sure the job was a good one. Lots of willing helpers were essential to getting the cover over safely. One of two teams battening down the sides. 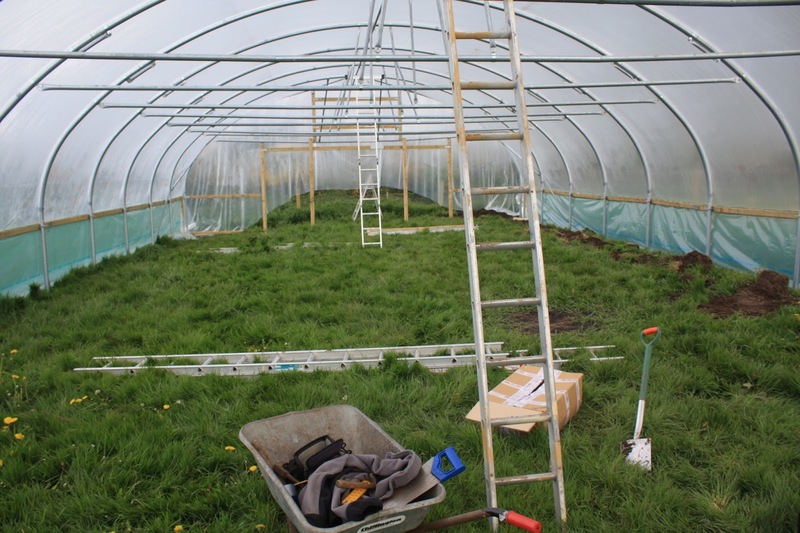 With so much help the cover was pulled over the structure like a dream, with some long ladders and a bit of monkey-action on the crop-bars. 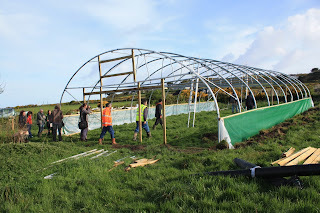 Within an hour the first end battens were in place, and we had split into two teams to batten the sides. 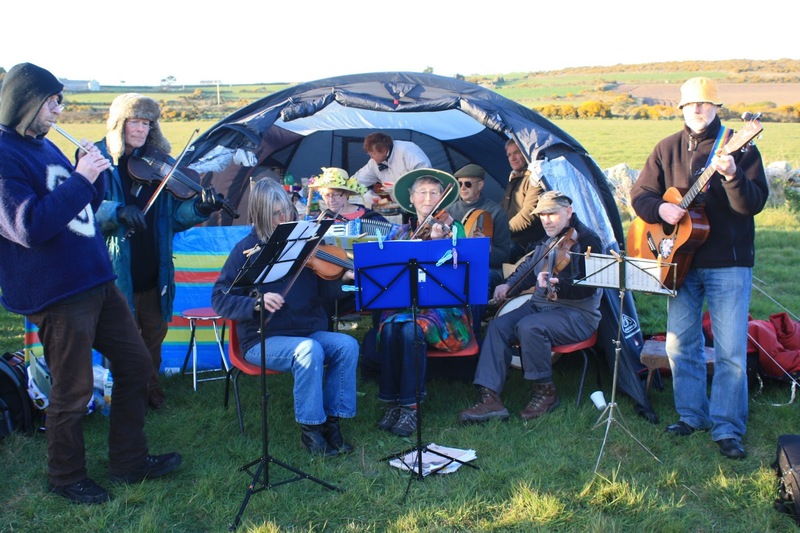 People were able to start drifting away at this point, leaving those with more time to give to complete fiddly tasks for the rest of the day. 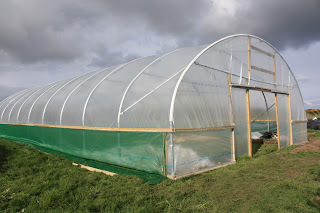 By 18:00 the whole skin was fully battened down and trimmed to fit, with the extra polythene panels at each end also in place, though the louvre windows and sliding doors didn't go on until Friday afternoon (and the rollers for the vents on Saturday afternoon). At the end of Thursday, just before a violent hailstorm! 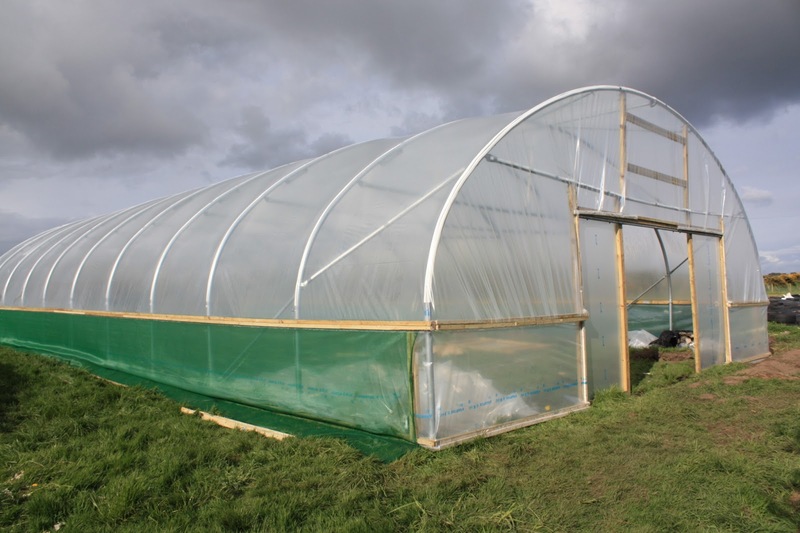 Tomorrow morning (Thursday 16th) we will be taking advantage of a forecast window in the weather and getting the skin on our new polytunnel. Anybody wishing to join us please be here at the farm at 08:00 ready to go! There'll be hot coffee and biscuits. The first 2 hours are critical, with all hands on deck, after which we can take things further with anyone willing to stay longer. There will be hot soup and bread at lunchtime too. See you there! Film and food this Saturday. This Saturday at 7pm in St Just's Women's Institute Hall (near the Parish Church) we will be showing "Edible Cities: Grow the Revolution", a fun, fast-paced feature length documentary journey through the local food movement. Delicious veggie food will be served, using some farm produce, and there will be entertainment from the Bosavern Singers. A donation of £7 to cover the food and film is suggested, everybody welcome. 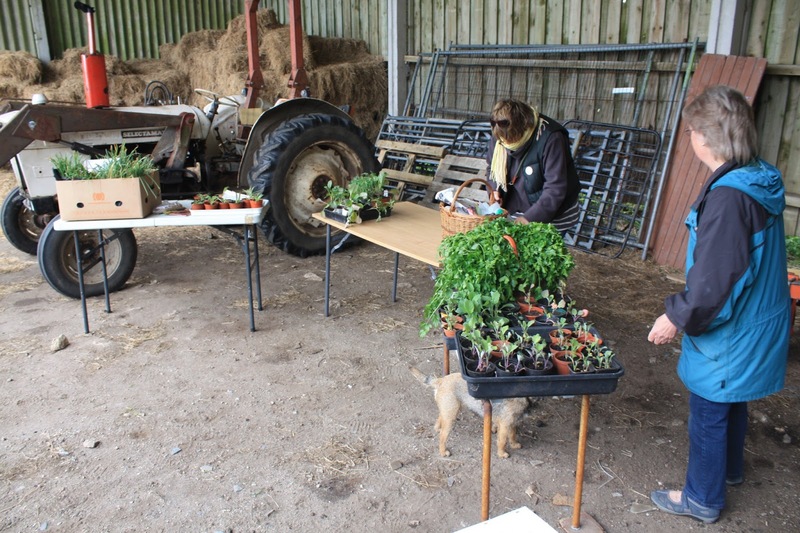 Setting up the seedling swap in our Dutch barn. 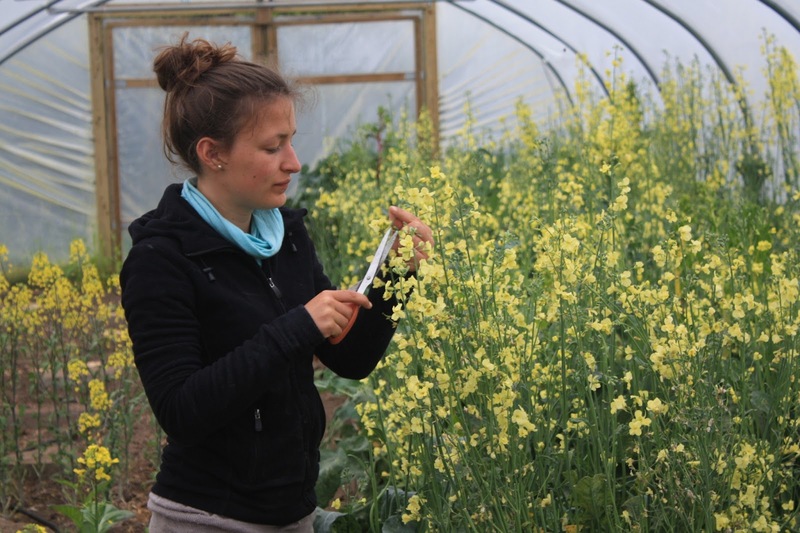 Lots of thanks heading to Lisa, from Germany, for all her hard work on the farm over the past two weeks. We wish her well on her next few farms and for the rest of her stay in the UK. 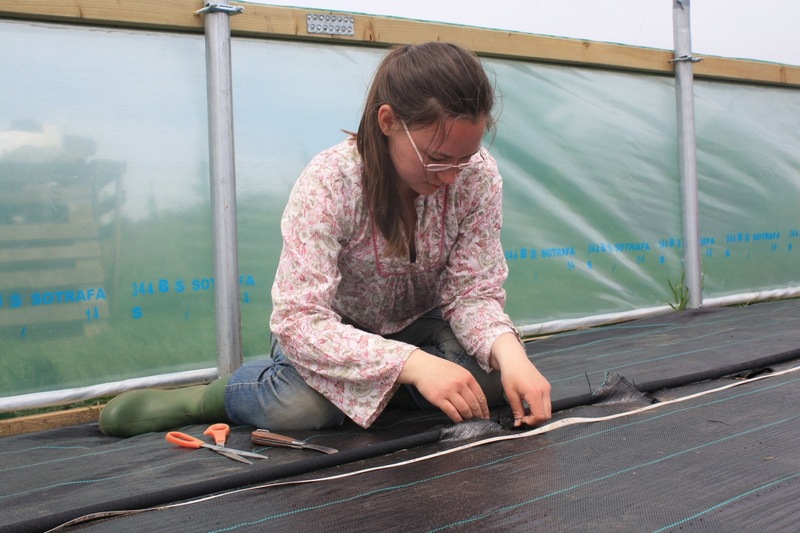 Lisa working in one of the polytunnels. 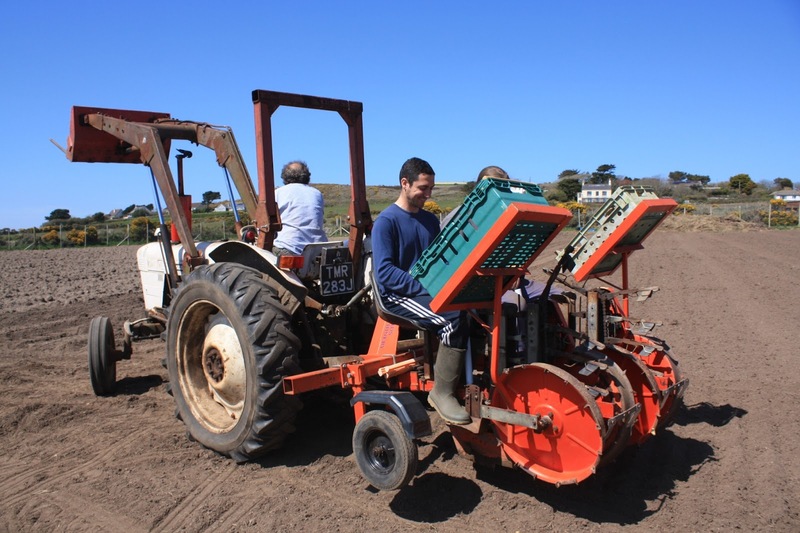 On Thursday last week (2nd May) we finally began planting Sturon onion sets in the new maincrop field (where the chickens and pigs were last year). 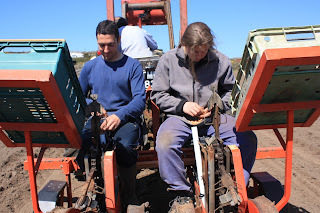 We have recently bought a two-person tractor-driven module-planter, which we rigged up to plant onion sets using some water-pipes to feed the onions into the ground. Two of our wonderful wwoofers, Carlos from Spain and Yaran from Switzerland, were the first to try the new device, and by the end of Thursday they had planted almost half the onion sets. Carlos and Yaran loaded up with onion sets. 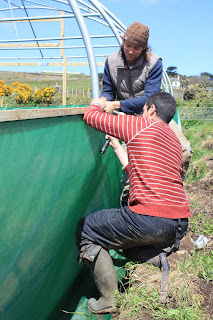 Feeding onions into the water-pipes for planting. Unfortunately we couldn't work out how to alter the machine to allow us to plant 4 lines of onions in a 1.2m (4 foot) bed, so the other two lines were planted by hand in the traditional way. 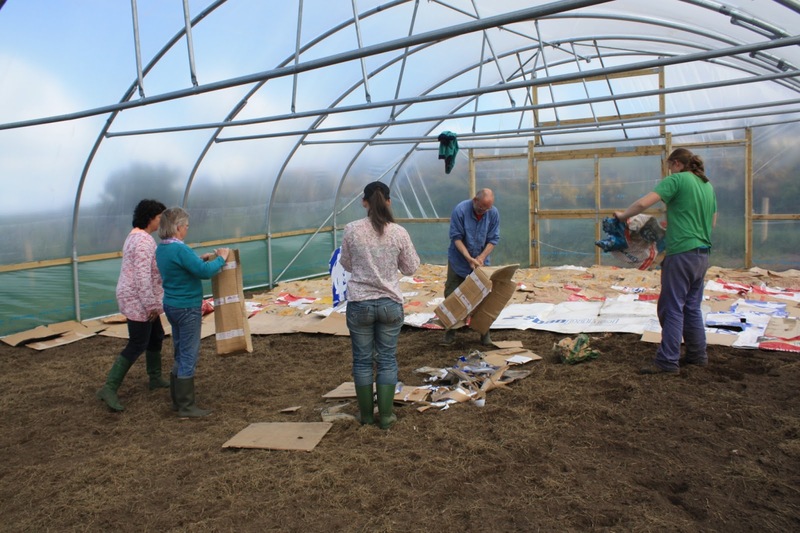 We finished this task on Monday morning, again thanks to our wonderful wwoofers, so now all this year's onions are in the ground. 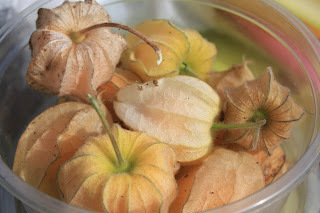 Here's hoping for a good growing season and onion harvest, not more of those little picklers we got last season! Helen, Lisa and Yaran planting onions by hand. The tea-fairy appears for a welcome break. 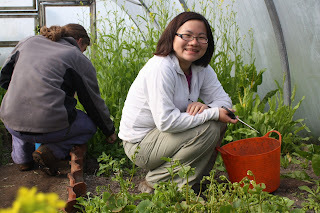 Many thanks to Helen from Beijing, who wwoofed on the farm for 5 days and left yesterday morning. Thanks for the gift of chopsticks! 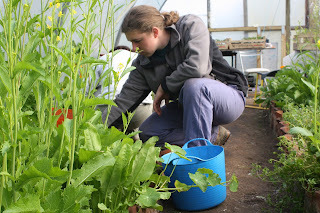 Helen harvesting salads in the Mothership polytunnel. Four market stalls over the Bank Holiday weekend. We've been busy this weekend! On Friday, as well as producing 18 veg boxes for our regular customers, we ran a small stall at the gates of St Just Primary School at home time, selling eggs and veg to parents (thanks to Jenny for running this stall). 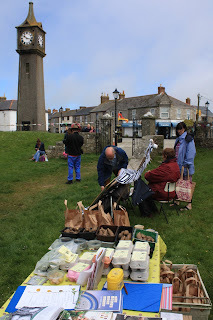 Then on Saturday we had our usual stall at Pendeen Farmers Market in the Centre of Pendeen (thanks to Sonja) from 10:00 till 13:00, plus a stall at the Lafrowda May Fair in the medieval open air theatre of St Just (thanks to David and Lynne for giving up their days off to run this, and to Willow and Jenny and Alice for helping out). Then on Sunday we had a stall at Pendeen Rally, where we sold eggs and veg and jumble to the tune of a steam organ then Pendeen Silver Band (thanks again to Alice and Sonia for running this stall). 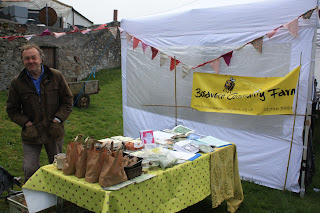 David staffing our stall in the Plen-an-Gwary. Lafrowda May Fair in the centre of St Just. 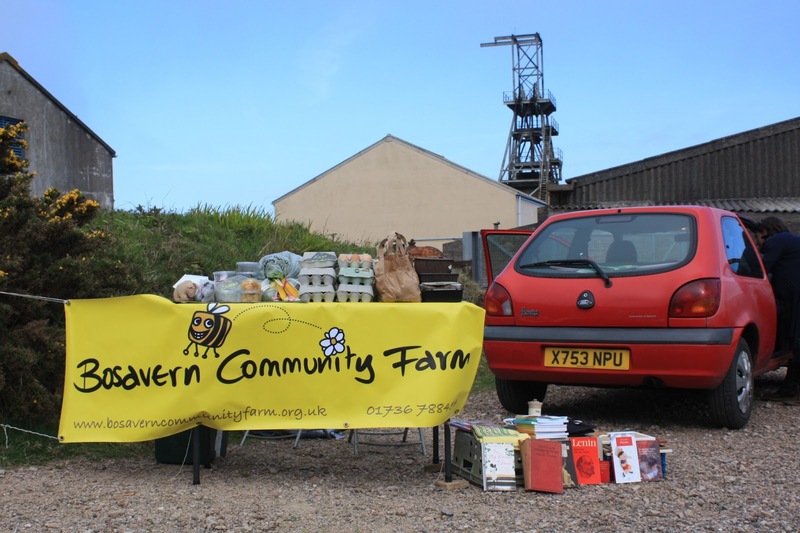 Our stall at Pendeen Vintage Rally. Physallis from our polytunnel for sale on our stall. First potato plants peep out. 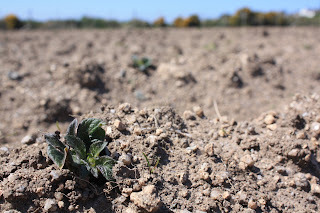 On Thursday 2nd May, as we eventually started planting onion sets in the maincrop field (see later blog entry), we spotted the first few potato plants sprouting out of their ridges. The ground has been cold this year and plants have taken their time to stick their leaves out of the earth. 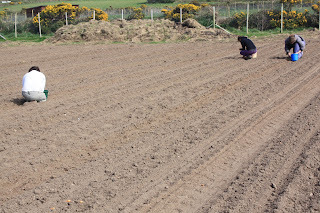 New potatoes will come later than the last two years, but with the recent warm weather we are still hoping for lovely Maris Peer earlies in June. 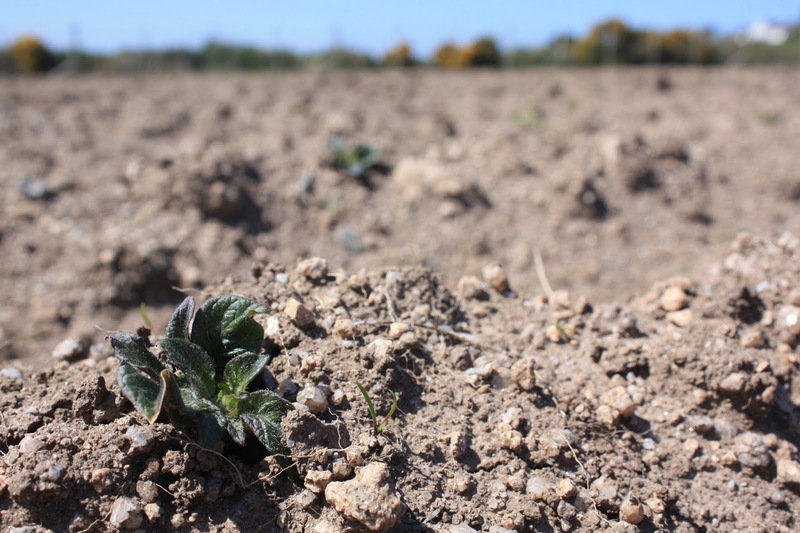 One of the first potato plants to sniff the air. 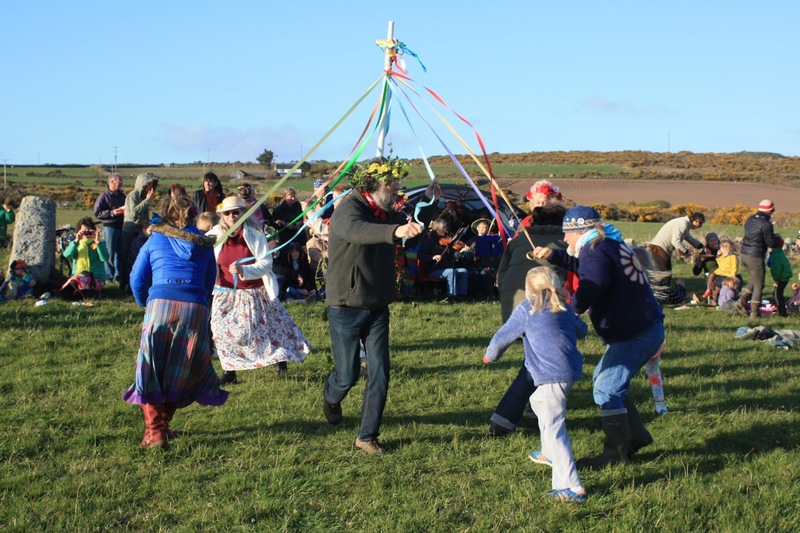 For the third consecutive year Bosavern Community Farm has been pleased to host St Just's Maypole Dance in the Standing Stone Field. This was a special year as it was the event's 25th anniversary, and the last to be organised by Cheryl as she has now passed on the rains to Andrew Corser, one of the farm's board of directors. 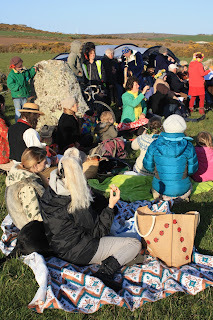 As usual the event was well attended, with at least 50 people, and the sun shone for us (though the strong northerly wind was a little chilly). 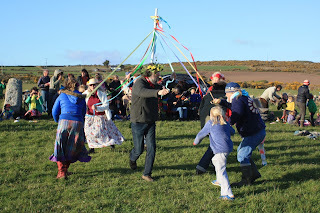 Maypole dancers getting into the swing of things. The lovely musicians leading the dances. Watching the dancing and tucking in to the shared feast. 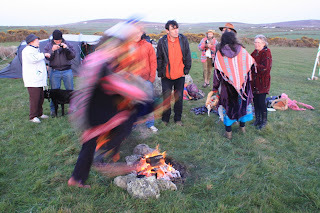 Leaping the fire at sunset. 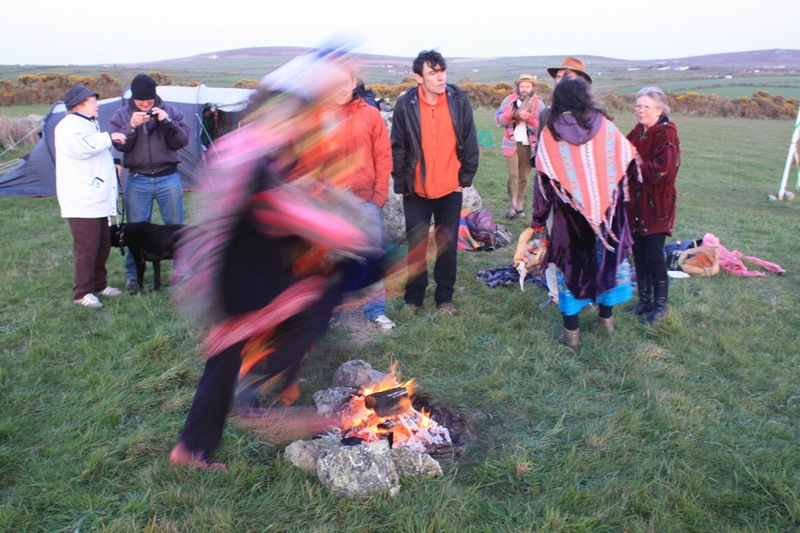 Many thanks to all the people who helped make this event, and to everyone who brought food and drink to share on the night. After harvesting the last of our leeks towards the end of April, we laboriously dug the ground over (150 square metres), and on April 29th we sowed the last beds of broad beans (variety Witkiem) for this year, and two beds of Meteor peas, then on April 30th we sowed three beds of runner beans (White Emergo and Enorma) and erected their teepees. 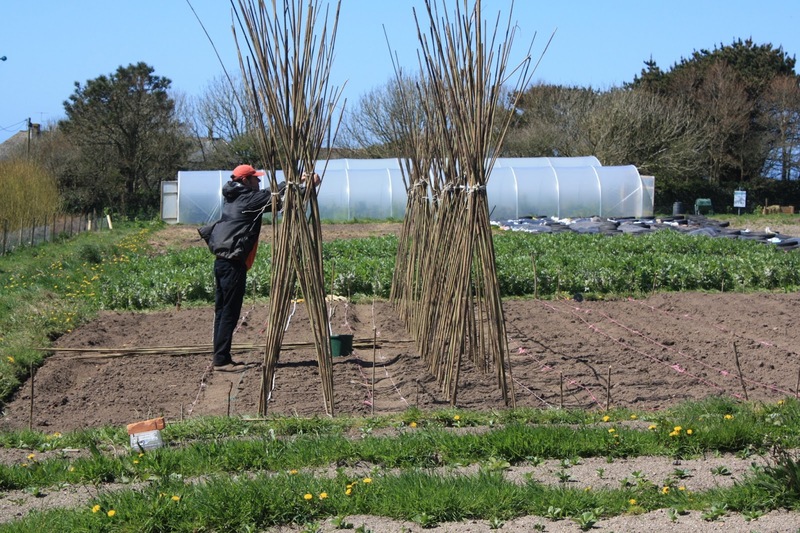 Jim erecting runner bean teepees. 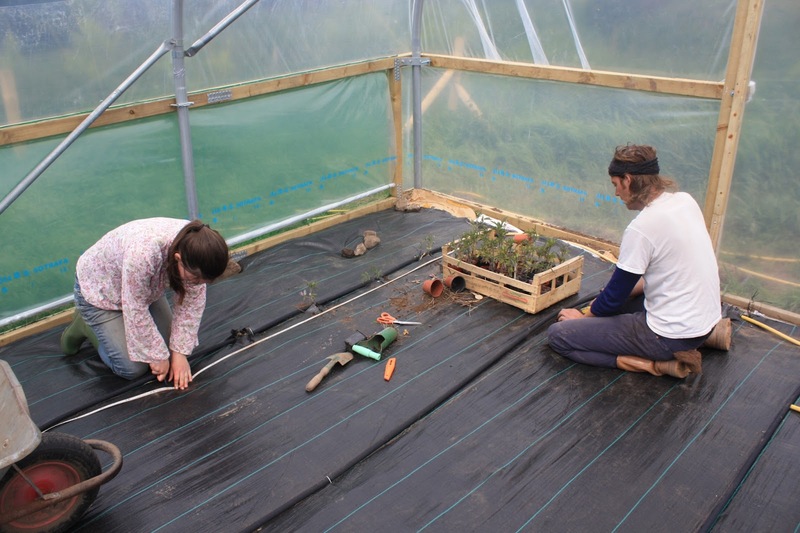 Lisa and Jim erecting teepees, Joan sowing runner beans. 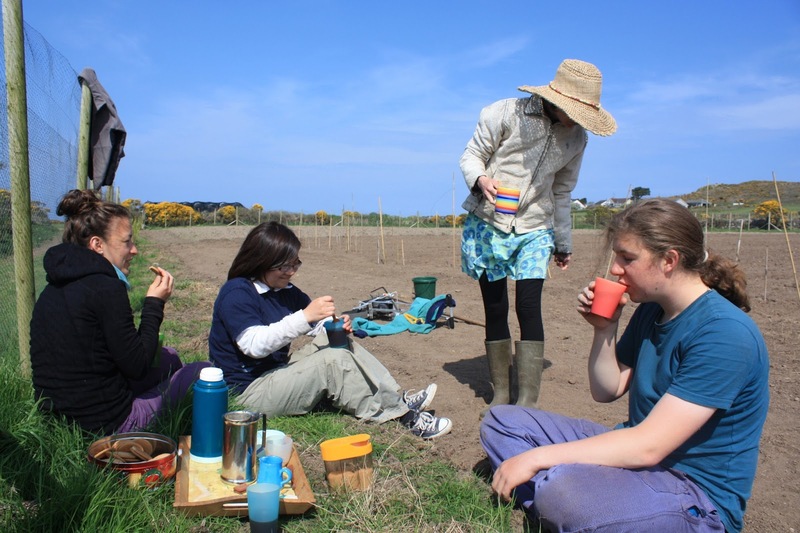 Thanks go to all the volunteers who helped prepare the land and sow the legumes, as well as the people who donated bamboo canes to use as supports - and of course the tea fairy!